Rhianna and Olivia are in CM1 and CE1 respectively and both have been attending Ermitage since Petit Section. English is the primary language spoken at home, though the girls are now bilingual and switch between English and French with incredible ease. One of the reasons the Pooles selected Ermitage for their daughters is because at Ermitage, it’s normal to be different: from a different country or a different culture, children learn to understand each other’s differences. Both girls have had a number of memorable experiences at L’Ermitage. Rhianna recently had the honor of being asked to be one of the school ambassadors at the school’s “open day” where she enjoyed herself thoroughly. 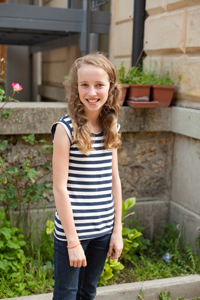 In addition, Rhianna and Olivia both participate in lunch time clubs including Irish Dancing, German, Textile and Science. They particularly love to dance! For the Gratzmuller family, “internationalism” signifies above all else an openness to the wider world, in all its variety and richness. It is the capacity to observe, to understand and, most of all, a desire to discover other cultures, languages and customs. Thomas entered Ermitage in 7th grade (after completing 6th grade at the French Lycée of Budapest) ; he is now in 10th grade. 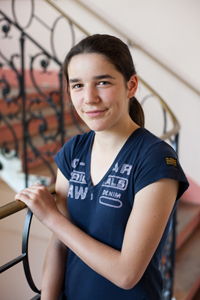 Emma has been at Ermitage since 6th grade, and is now in 9th grade. 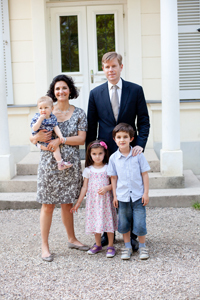 “When our children joined Ermitage, they hardly spoke English. We took the challenge to place them in the bilingual section, though they could have started in the Francophone section; we really believed in their ability to learn the language. We received enormous help and support from their teachers; sometimes it seems almost as though they believed in our children’s ability even more than we did! It was a challenge, but eventually they caught up with the rest of the class. 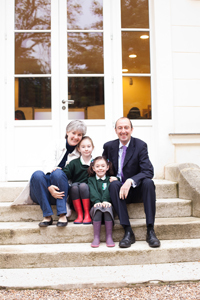 Today, after only three years at Ermitage, they are both studying as Anglophone students in the OIB program.” In addition, Thomas and Emma speak Hungarian fluently. 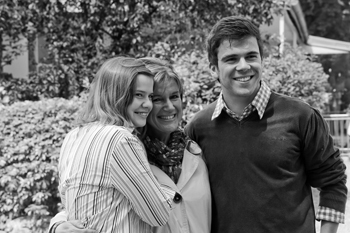 The Cook family has been a part of Ermitage since 1997. 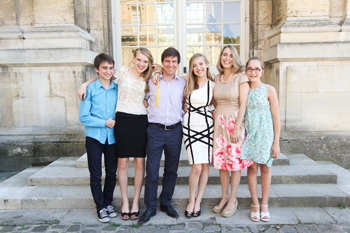 They have four children, Juliette (currently in her first year of university at McGill in Canada), Natalie (IB2), Adrian (Seconde) and Margaux (CM2). Juliette was the first of her siblings to integrate Ermitage at the age of three. Her mother Dianne has been teaching English at the school since 2002. The Cooks say that Ermitage nurtures and implements the Round Square “IDEALS” during the school day through the diversity of the student body and teaching staff, through activities offered by the school – including CAS and initiatives like 'Love in a Box' as well as day to day interactions amongst students both in the class and during recreation. Zoé, Léo and Tom have been at Ermitage since the Petite Section. Zoe is now in 7th grade, Leo is in 5th grade and Tom is in 2ndgrade. They speak mostly French at home, except on Wednesdays when they speak English with their maternal grandmother. The Monty family chose Ermitage first and foremost because of the level of English taught; they were then convinced by the school’s philosophy, and its attentiveness and openness. They find Ermitage to be a smart school, that has found a way to balance discipline and open-mindedness, which respects programs and extracurricular activities, and where qualified, enthusiastic teachers stoke their students’ desire to learn. Thomas, Nicolas, Maxime and Alexia Koch speak three languages and are deeply interested in cultures different from their own. They joined Ermitage in 2003, after spending four years in Poland. 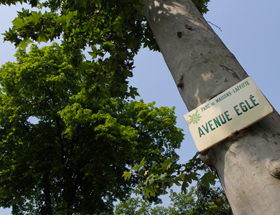 At Ermitage, they followed the Baccalaureat with International Option (OIB) program. Since then, the three eldest have successfully graduated with their Baccalaureat, and two of them are currently pursuing studies in the UK. The Koch children have taken part in multiple school exchanges abroad, in Canada, in the United States, including Boston and New York, and in China.